It's the start of lawn fawn's March inspiration week! Today, we're showing off happy trails and starry backdrops. I made a pretty simple card, but it makes me smile. I pieced together "be" and "a" from different words in the "on the mend" set. I made sure that they were the same font and size. I hope you like it! There's much more to see on the lawn fawn blog today. Eek! So cute! I love that you make everything smile! Sweet and simple but the sentiment carries a much bigger meaning. And the heart adds the loving touch. Always the best. Adorable card Elena! 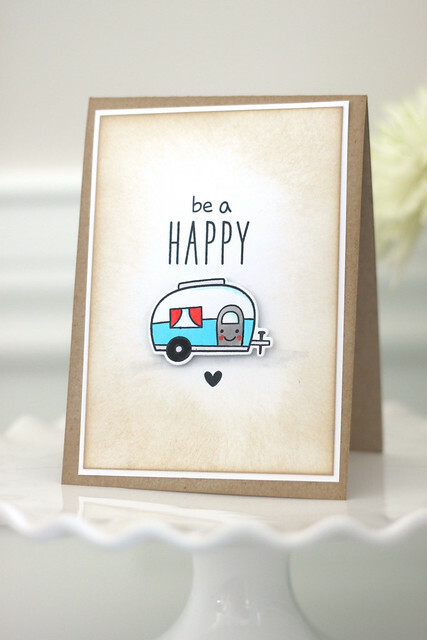 Love your use of Distress Inks for the background, and the cute smiley face on the camper is awesome!!!!!! Love your card design, made me smile too. Eeeeeek!!! The smiley face on the camper - i die!!! Just when I think I can't love this set anymore!! You make this amazing card!! Your style is flawless i tell ya!! rag doll dies, easter bunny edition. True Stamp promo code and big giveaway!